The Show Must Go On! This tired cliché is the catch cry of our industry, used most when something is not going to plan. But we must be careful that this determination for the show to happen does not become an excuse for shortcuts or negligence. Pollard Productions has a story of the ‘one that almost didn’t happen.’ It involves a live audience of more than a million people and a live feed to every major network in the world … More on that later. There have been several catastrophic rigging failures in recent years. In 2003 the lighting grid for the Justin Timberlake/Christina Aguilera concert in Boardwalk Hall New Jersey collapsed. Fortunately the show was still in set up mode and the crew managed to escape with their lives. The finding was that the load was not applied to the rigging grillage correctly and the grillage came down with the lighting grid. That same year an outdoor stage collapsed during an event in Pretoria, South Africa. The uprights buckled in wind causing the collapse of the roof. A woman was paralysed from the waist down. The accident was caused by a lack of bracing and failure to consider changes in the weather. Many productions are a few bad decisions away from complete disaster. The best way to minimize risk is to ensure that qualified personnel do all rigging work. That seems obvious, except not all riggers are created equal. Under certain circumstances a riggers license can be obtained with as little formal training as a one-weekend course. Even licensed personnel who have undergone the full training course are not necessarily equipped to deal with all the variables of a production. The licensing process is designed for the construction industry, so a fully qualified rigger could have absolutely no understanding of rigging methods required for the entertainment industry. They may not have been trained to fully appreciate the design of the building that they are attaching to, nor the properties of steel when under stress, neither the steel in the roof nor the steel and alloy trusses we use daily. That’s why even though you may have ticketed riggers on the crew you should still talk to a reputable rigging company. You want to ensure you have fulfilled your own duty of care by seeking the best advice possible, particularly when doing something out of the ordinary or when you are in a different venue. A reputable rigging company knows the roof of all the venues and has an understanding of the load charts for those venues and how to rig as to not exceed those load charts. There are rigging companies out there who either don’t understand the load charts or chose not to work within them. That is pure negligence. When you have something difficult or heavy or risky to rig, do your research. Find the company that offers you the most experience and the absolute guarantee that all rigging is within the design capabilities of the venue and the equipment being rigged. Ask for the written proof that it is a reputable company, which has already done this as part of their pre-production. When there are no load charts, a reputable rigging company will have an engineer calculate and approve a rig. It was the Hong Kong Handover, a multi-million dollar waterborne spectacular. Pollard Productions were appointed as the Production Co-ordinators. It involved building an enormous barge, fitting out 50 vessels, building and commissioning pumps and then mounting the rest of the show elements on these barges - lights, audio, sound, special effects, the whole works. The centrepiece was an enormous inflatable sphere. It was mounted on a tower on the barge we had commissioned in China. It was to inflate on cue and when inflated would be over 100’ in diameter and over 100’ from the waterline. Five weeks before the show the inflatable sphere arrived from the US. With their crew calling the shots, we docked the massive barge and tower in a floating dock for the inflatable to be attached. Once attached, with the pumps and jets activated, it was a truly spectacular thing inflating and rising above the harbour; everything the producers envisaged. Except they envisaged it lasting more than the 15 minutes! Tears began in the fabric and within minutes the entire thing was shredded. Back to the mainland for a very unpleasant production meeting. The inflatable company assured us that with some re-enforcement a new sphere would not shred. 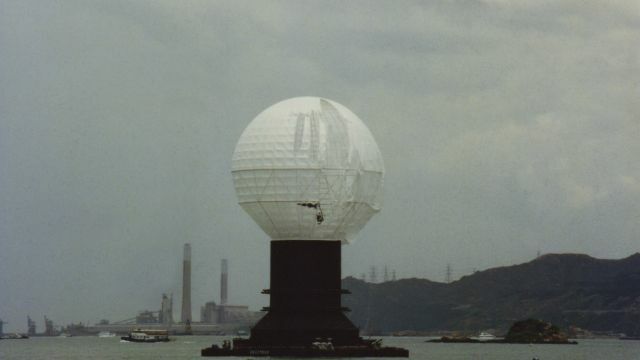 The producer was not entirely convinced and whilst the inflatable company was sent back to the States to work around the clock to make a new sphere, he had us commission the shipyard in China to build a massive gridded metal sphere, a full 100’ in diameter that would support the inflatable. The new sphere arrived three days prior to the event. This one lasted four hours before shredding. Pollards were sent up to cut it free. That much fabric, even in a light breeze, was hair raising. An overnight re-design took place - this time using a gridded metal sphere. The show was a sensation. 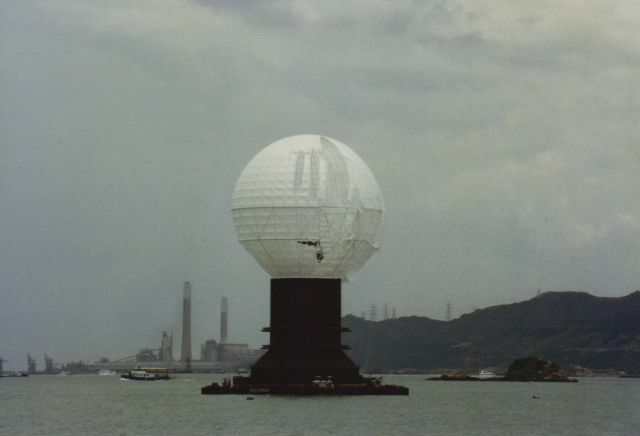 The magnificent sphere in the centre of the harbour, ‘Hong Kong’s Pearl of the Orient,’ graced the front page of newspapers the world over and it was only the very tired production team who really knew what could have been. Living it, you really have to wonder why anyone would work under such pressure, but delivering an amazing show, seeing the crowd, hearing the applause and reading the press reports makes it truly addictive. We wouldn’t have it any other way … and the show goes on. Project Manager – Pollard Productions Pty. Ltd.